What is the hourly rate to remove a tree? – FORTY OAKS TREE SERVICE LTD.
What is the hourly rate to remove a tree? So this may be THE most common question we get from folks who are surfing our website or Facebook page. Perhaps someone heard their neighbor had a tree removed and it cost XYZ dollars or that it took a guy a few hours to do a tree similar in size to their’s. They perhaps think that with an hourly rate in mind they can make some sort of educated guess about what it will cost to complete their job. We get it. It is normal to want to establish a ballpark cost of something before we are faced with the actual sticker shock. We want to practice the face we will make when they tell us that the job is going to cost us more than a week’s groceries (even though many people are pleasantly surprised when we give them a price lower than expected!) Or, we don’t want to waste the Arborist’s time if we feel that it just isn’t in the budget for this year, or we are not quite ready yet but are curious to know what the cost will be. Unfortunately, an hourly rate alone is not what you want to be quoted for any type of skilled Aborist work. Chances are that you will pay more in the end for the work. Now let’s imagine you called those same companies for a free quote. Company A tells you that the job will cost 900 dollars. Company B tells you that the job will cost 720 dollars. Company B is a better price. But why? Both companies have taken many factors into consideration to get to that price. They have estimated how long the job will take them to complete and calculated the cost using their approximate hourly rate and the hours required to complete. Company B was more skilled/experienced and is more efficient. Yes, they charge more per hour, but they require much less time to complete. Another similar scenario we come across is the comparison between a company with an Aerial Lift (Bucket truck) and a climber. A company running a truck will always run at a higher hourly rate yet are not always faster than a climber. Sometimes they absolutely are, but this depends on a number of factors, such as the location of the tree, the drop zone (area and structures where the tree limbs/tree will fall), the experience level of the climber in comparison, etc. Unless you are 100% certain the job requires a bucket truck, get your quotes from the truck company and a couple of different climbing companies. 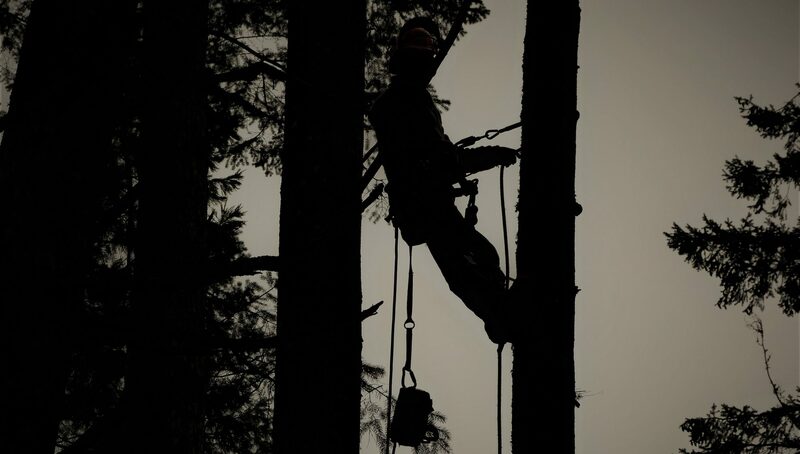 We have actually visited clients’ homes who were certain they needed a bucket truck and were pleasantly surprised to learn that the tree could be removed by a climber. Okay, so now we are going to tell you that we do, in fact, also run an hourly rate. The hourly rate is situational. For instance, sometimes we will quote a job and the client will mention that they want some additional simple pruning and maintenance or bucking and chipping. We would offer a quoted price for the skilled work and then offer them an hourly rate for additional simple pruning and maintenance. We also offer our repeat clients hourly rates for odd and end tree pruning and maintenance and landscape type work and especially for chipping or bucking. The hourly rate may vary based on what task is being performed but is generally only offered on services where the skill level is fairly basic and comparable between service providers. Every job is different but the main deciding factor affecting price is the difficulty of the job. If there is a significant skill requirement or danger level then the job is going to cost more. Risks are not always visible to an untrained eye so it is crucial to have a professional take a look. Often a climber will not divulge how many hours he thinks each tree will take. He takes into consideration many factors, such as skill level, danger level, risk level, special tools required, etc. He will then present the quote as an entire price and say he will be on site for approximately X amount of hours. It is also important to note that each company may include different services in their total price. For instance, does the price include clean-up, bucking to firewood size, chipping, etc? What if you didn’t want clean-up or bucking? Can you opt out of those services or is that automatically included in the price? You must ask all of these questions to be sure you know what you are getting in the price. We can’t recommend enough to get a couple of prices. Choose the company wisely by weighing price with your overall feeling of trust for the company and ALWAYS make sure the company has proper insurance coverage, both business liability coverage (should something unfortunate happen to your property) and employee liability coverage (should an employee of the company become injured on site at your home) (WorkSafe coverage in BC). You can ask the company to provide proof of this coverage.